Give Me Sustainability and Conservation, But Not Yet. WE ADD UP, a culture-changing marketer (a “tremendous” one at that, says none other than Al Gore) features an essay by Nature Calendar writer Erik Baard on its blog. That’s a poor plea for the 21st century, but the American ecological sentiment seems to parallel the St. Augustine’s prayer for chastity and continence as a debauched youth. We seem to want to stay on the just-forgivable side of “sinning” against nature. Is building a “sustainable economy” a matter of tweaking the machinery of our current lifestyles to stay narrowly within the Earth’s survival margins? Is conservation meant to secure images of natural plenty merely for our own peace of mind? To save our environment, President-elect Barack Obama will have to do much more than raise automobile fuel standards, reverse President Bush’s ill-conceived executive orders, and invest in alternative energy. He must lead a profound culture change that redefines the material American Dream, or nurture the culture change that starts with us at the grass roots. Despite the campaign slogan “we are the change we need,” it’s truer to say that we need to change. Few voters want to hear that, and no politician will win on that theme. While you’re there, please take a look at WE ADD UP’s hand-printed, organic cotton shirts, each of which is emblazoned with a small action any one of us can take to improve the environment. 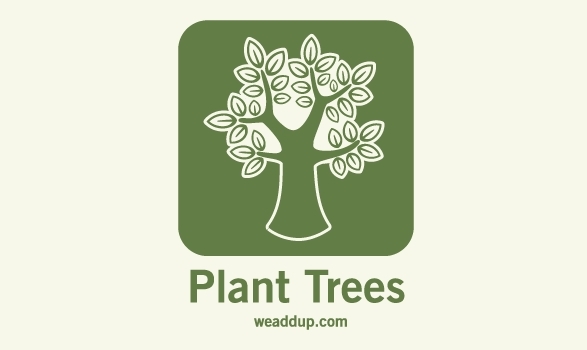 WE ADD UP was created by artist Jill Palermo, whose “Plant Trees” t-shirt icon is pictured above. To learn more about WE ADD UP, click here. Don’t Leave Sarah Palin Lonely. The Discovery Channel has a wonderful opportunity for all of you nature lovers. We’re now casting for a new reality tv show, the Alaska Challenge show. I have attached a document that will explain the show. If this interests you, anyone else in the group, or anyone you may know. Please follow the directions listed in the document.